Pedals is a practical road safety awareness course for pupils aged 5-7 in Years 1 or 2 at school. This is the age group for whom the road safety learning concept of 'stop look listen' is generally considered appropriate. Achieve some of the simpler Level 1 outcomes – look behind, set the pedal, start, pedal and stop. Explain how wearing a tabard and helmet can improve their safety. Stop, look and listen before crossing the road in a simulated traffic environment. All trainees receive a certificate of participation. What is Bikeability Level 1? 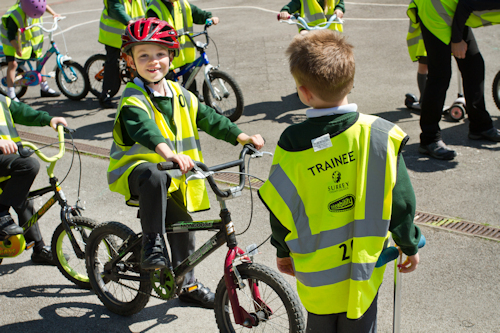 Bikeability Level 1 is part of the National Standard for cycle training. Watch the Department of Transport video about Level 1. It teaches basic control and balance skills in a traffic-free environment - generally the school playground. It is suitable for those who have just learned to ride and no longer use stabilisers. The course lasts for 3 hours. All trainees receive a certificate showing their achievement against each individual outcome, enabling their parent or carer to see where they need most help to continue improving their riding. What is Bikeability Level 2? Bikeability Level 2 is part of the National Standard for cycle training. Watch the Department of Transport video about Level 2. Before going on the road, show that you have the “Level 1” skills of control and balance, so your Instructors know that you are able to go on to the road. Also, that you can check that your bike is safe, for example that the brakes work. Start from the kerb, or from the outside of parked vehicles, after you have judged it is safe to start. Set your pedals, look for traffic and for people crossing. Stop by slowing down, looking behind for traffic that is following you and pulling over to a safe place on the left. If traffic is following you, signal to let them know you are stopping. Look out for hazards. This might be cars approaching from different directions or pulling out .It might be roadworks or a pothole in the road. It might be people who step off the pavement without seeing you. Look then make clear hand signals when cars and people are around, so they know what you want to do. Take the correct position on the road, clear of the gutter, staying in view of other road users and reducing the chance of a vehicle squeezing past you. Pass parked vehicles, looking behind and then, if it is safe, moving out smoothly. Be far enough out that you won’t be hit if someone opens their car door. But also look out for vehicles coming towards you; you may need to move back in. Check for people in the vehicles and recognise signs of a vehicle that could pull out. Pass side roads looking out for vehicles turning in and out and understand the correct priority. Turn left into a side road. Look behind, signal to other road users and look ahead to see what is in the side road. Look out for people crossing the road, and have another look behind before turning. Make a U-turn. Look behind and ahead to make sure there is nothing coming. Cover your brakes when turning and finish in the correct riding position. Turn left out of a side road. Look behind, signal to other road users and take the correct position. Understand that traffic on the ‘major’ road goes first, so if there’s any coming, you stop to let it pass. Make the turn when there is a safe space in the traffic. You also look for people crossing the road. Turn right out of a side road. Look behind, signal to other road users and move out to the correct position. Understand that traffic on the ‘major’ road goes first, so if there’s any coming, you stop to let it pass. Make the turn when there is a safe space in the traffic. You also look for people crossing the road. What is Bikeability Level 3? Bikeability Level 3 is part of the National Standard for cycle training. Watch the Department of Transport video about Level 3. Trainees receive a certificate on completion of this course, showing the learning skills taught, along with detailed recommendations from the Instructor where appropriate. Due to a period of inactivity your booking is about to terminate and you will be redirected to the start of the booking process automatically.